Rockstar Games have finally announced that the long await Undead Nightmare Pack will be available October 26th for download on Xbox Live and the PSN, just in time for Halloween. "Undead Nightmare turns the world of Red Dead Redemption upside down," said Sam Houser, founder of Rockstar Games. "The supernatural vibe and the return of some favorite characters create a whole new game inside an already incredible world." Undead Nightmare introduces a new single-player storyline, as well as some new multiplayer content. In this new downloadable pack the whole of the West has been ravaged by a zombie plague, the landscape has been decimated and uninfected citizens are fighting for survival in the towns and settlements against the undead horde. John will have to ride out into the now unpredictable and terrifying vast world in order to find a cure. With four different types of zombies, mythical creatures and zombie wildlife you’ll find yourself with an itchy trigger finger with zombie cougers afoot, however with your less traditional Blunderbuss -which you can load-up with the looted remains of the undead- you'll have a amazingly atmospheric ride in what is Rockstar's first attempt at Zombies. For those that have downloaded the Legends and Killers Pack and the Liars and Cheats Pack you will also be able to use the deadly Tomahawk and Explosive Rifle from the respective packs. The single-player story features new challenges, quests and ambient events, including Missing Persons, where you will need to find missing survivors amongst the undead. The new competitive multiplayer and free roam content includes Undead Overrun; a new multiplayer survival mode where players must work together to stay alive against the odds. 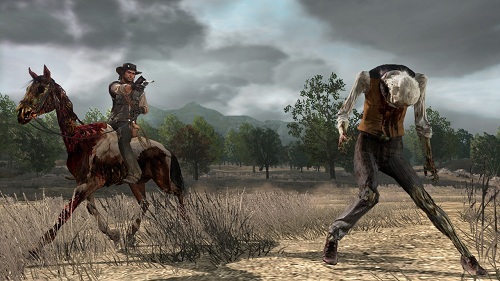 The Undead Nightmare Pack will be available from Xbox Live and PSN for 800 MS Points and £7.99 respectively and requires a copy of Red Dead Redemption to play the pack, this is looking to be possibly the best new game for a good scare come Halloween 2010, and we definitely will not be missing out on it. 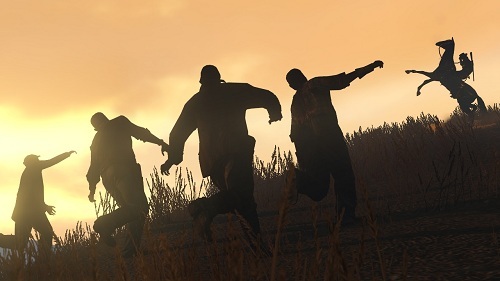 Rockstar have also announced that they are releasing Undead Nightmare, a single stand-alone disc that does not require you to own Red Dead Redemption, and bundles together The Undead Nightmare Pack, Outlaws to the End Co-Op Mission Pack, Legends and Killers Pack, Liars and Cheats Pack, and all of the Multiplayer Free Roam modes that have been released to date, a release date is unavailable at the moment, however it will be available to purchase in all good store for £24.99.